FROM ROUTE 1 HEADING SOUTH ~ Exit Route 1 at the route 60 off ramp and follow signs to Route 60 East-Revere. Follow to next rotary, taking the second exit, continuing on Route 60. Route 60 will then become Route 1A at the Belle Circle traffic rotary where you will continue to drive straight thru the traffic rotary. Follow 1A until you see the sign for Route 145-Winthrop on the left. (There will be cross on a hill at the light). Take left and follow to traffic circle. Head towards traffic lights straight ahead into Orient Heights Square. Go straight ahead and over the train bridge onto Saratoga St. Saratoga St. will then become Main St. once you have entered Winthrop. After you have entered Winthrop, take a right at the 2nd light off of Main St. onto Hermon St. Follow Hermon St. to the stop sign. (Police Station on the corner). Go straight thru and Hermon St will become Winthrop St. The funeral home will be about 50 yards on the right, #210 Winthrop Street. FROM ROUTE 93 HEADING SOUTH ~ Get off at exit 24B (Callahan Tunnel/Logan Airport/1A). Follow the Route 1A sign and exit the tunnel and take the Route 145 Bennington St/ Winthrop/Chelsea exit. Follow exit until you get onto Bennington St. East Boston. Follow Bennington St and take a right at your 5th light onto Saratoga St. (Route 145). Go over the train bridge and Saratoga St. will become Main St. once you have entered Winthrop. After you have entered Winthrop, take a right at the 2nd light off of Main St. onto Hermon St. Follow Hermon St. to the stop sign (Police Station on the corner). Go straight thru and Hermon St. will become Winthrop St. The funeral home will be about 50 yards on the right, #210 Winthrop Street. FROM ROUTE 93 HEADING NORTH ~ Take exit 20 to Ted Williams Tunnel. Exit Ted Williams Tunnel following signs to Route 1A Revere. Take the Route 145 (Bennington St/Winthrop/Chelsea) exit onto Bennington St. East Boston. Follow Bennington St. and take a right at your 5th light onto Saratoga St. (Route 145). Go over the train bridge and Saratoga St. will become Main St. once you have entered Winthrop. After you have entered Winthrop, take 2nd light off of Main St. onto Hermon St. Follow Hermon St. to the stop sign (Police Station on the corner). Go straight thru and Hermon St. will become Winthrop St. The funeral home will be about 50 yards on the right, #210 Winthrop Street. FROM REVERE AREA ~ Take a right at Elliot Circle at Revere Beach onto Winthrop Pkwy. Follow Winthrop Pkwy into Winthrop. Winthrop Pkwy becomes Revere St. Follow Revere St to the traffic light, and bear right. Go up and over the hill, thru a flashing light, to the next set of lights. At this light, bear left onto Winthrop St. Follow Winthrop St. until you come to the Police Station on the corner to your left. Take a left at the Police Station, and around traffic island, onto Winthrop St. The funeral home will be about 50 yards on your right, #210 Winthrop Street. FROM MASS. PIKE-HEADING EAST ON ROUTE 90 ~ Follow the Ted Williams Tunnel/Logan Airport extension of Route 90. Follow the Route 1A signs in the tunnel and exit the tunnel. Take the Route 145 Bennington St/Winthrop/Chelsea exit onto Bennington St. East Boston Follow Bennington St and at your 5th light take a right onto Saratoga St. Go over the train bridge onto Saratoga St. Saratoga St. will then become Main St. once you have entered Winthrop. 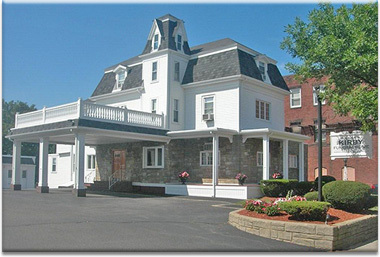 After you have entered Winthrop, take a right at the 2nd light off of Main St onto Hermon St. Follow Hermon St. to the stop sign (Police Station on the corner). Go straight thru and Hermon St will become Winthrop St. The funeral home will be about 50 yards on the right, #210 Winthrop Street.